This year’s campaign kicked off with the first donation of $10,000 from Grambling State’s President Rick Gallot who joined by five of the University’s community partners and alumni at this year’s kick-off event. The campaign’s lead partners include Coca-Cola, AT&T, Origin Bank, First National Bank, Primary Health Services, True Care Dental and Super One Food. In addition to the corporate partners, notable Alumni including former baseball Coach Wilbert Ellis, Grambling University Foundation board members, and Grambling University Alumni Association President, Russell Le’Day showed their support at the campaign’s launch event. The results of every gift and contribution to the Bring it Home campaign helps create real change on the campus of Grambling State. Last Year’s Bring It Home campaign helped provide more than $300,000 in direct support for students in need. This impacted the balances of hundreds of students through a variety of scholarships; including GAP which is designed solely to support students in reaching the academic finish line. 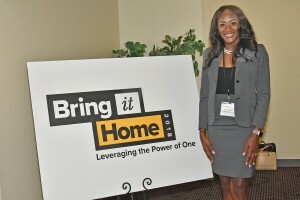 To date, Grambling State’s Bring it Home campaign has helped bring more than $250,000 in grants to campus. Our supporters offer more than a donation, but you also ignite powerful conversations, investments, and help from our alumni and community members. Those contributions help fund cutting-edge research in robotics, biomedical research, technology, and more right here on campus. Students are the lifeblood of our campus and as they transition to alumni, they become the anchor of our legacy. In 2017, each of our active alumni chapters did an amazing job spreading the word and growing the investment our past graduates make in Grambling. That investment showed up, not only in the dollars on the balance sheet; it resulted in an eight percent increase in alumni giving. You can be a part of creating even more positive change this year at Grambling State. Give today at www.gram.edu/giving and share the hashtag #BringItHome2018.